Ketorocin 0.5 Eye Drops is a member of the pyrrolo-pyrrole group of non-steroidal anti-inflammatory drugs ( NSAIDS ) for ophthalmic use . Ketorocin 0.5 Eye Drops a nonsteroidal anti-inflammatory drug which, when administered systemically, has demonstrated analgesic, anti-inflammatory, and anti-pyretic activity. The mechanism of its action is thought to be due to its ability to inhibit prostaglandin biosynthesis. Ketorocin 0.5 Eye Drops given systemically does not cause pupil constriction. 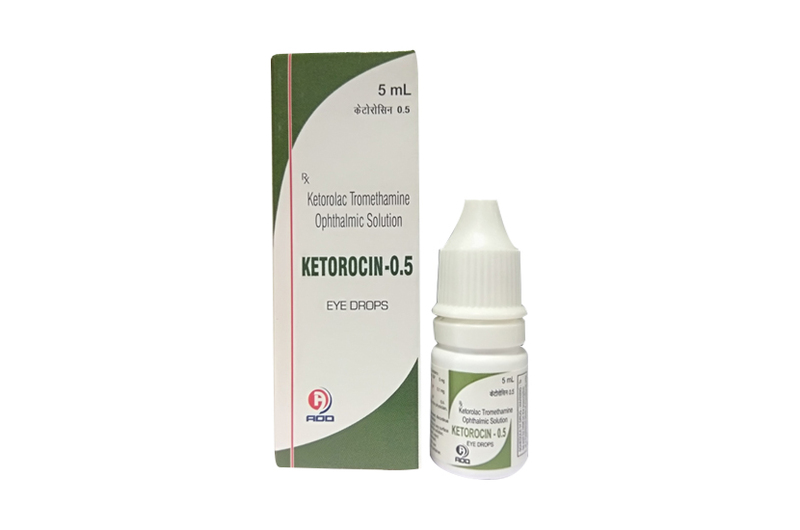 Ketorocin 0.5 Eye Drops is indicated for the relief of ocular itching due to seasonal allergic conjunctivitis . It is also indicated for the prophylaxis and relief of post operative ocular inflammation. Ketorocin 0.5 Eye Drops is contraindicated in patients with previously demonstrated hypersensitivity to any of the ingredients in the formulation. The recommended dose of Ketorocin 0.5 Eye Drops is one drop four times a day in the operated eye a needed for pain and burning/ stinging for up to 4 days following corneal refractive surgery. Ketorolac tromethamine has been safely administered in conjunction with other ophthalmic medications as anti biotics, beta blockers, carbonic anhydrase inhibitors, cyclopegics and mydriatics. Ketorocin 0.5 Eye Drops is supplied in one 5 mL Opeque Polethylene Bottle packed with printed labeled in a unit carton and, Such 25 Carton Packed in a Shrink Sleeves.Such 12 shrinks packed in a shipper.